Cross-Cultural Dialogues on Homelessness: From Pretreatment Strategies to Psychologically Informed Environments. As you may have surmised I live and work in the States, so in many respects the whole project was a transatlantic dialogue on homelessness. However, upon digging a little deeper it became evident that the dialogue that I sought was actually occurring on many fronts that included, but also transcended transatlantic considerations and really spoke to different cultures, roles, types of relationships, identity, power dynamics and so on. Cultural divides in need of crossing existed between workers and clients, clients and different systems of care that we had hoped to access, Peer and non-Peer workers, the different sub-groups of clients and workers – young and old, male, female, LGBTQ, across the whole spectrum of religion, race, and varied ethnicities, etc. The quest toward ‘productive dialogue’ is critical to building the person-centered relationships* that both PIE and Pre-treatment approaches value and defines as an essential part of our practice. *Relationships are central to the PIE 2.0 framework and more information can be found HERE. Our latest book project Cross-Cultural Dialogues on Homelessness delves further into some specific methods of dialogue paired with numerous narratives that demonstrate how cross cultural divides can be crossed in order to promote person centered relationships. Our hope is to share and encourage transatlantic dialogues on homelessness that includes our narratives, challenges and successes in order to promote mutual learning and communication, as well as a more informed practice. We have crossed the cultural divide in our work with colleagues at various conferences (e.g. International Street Medicine Symposium), sharing insights from around the globe. Of course this is not limited just to conferences, as cross-cultural perspectives on homelessness flow via journal articles, books, University coursework, staff trainings, and easily accessible podcasts, as well as through a variety of websites such as the PIElink that offers interviews and library materials on transatlantic homelessness issues. In fact, I recently taught the first graduate studies course on PIE and Pretreatment, utilizing multi-media resources from PIE-Link, with college students in the US. These forums, as well as the exchange programs between the US and UK, provide the opportunities to share insights from PIE and Trauma Informed Care approaches to homelessness. Advance Book Reviews: In Cross-Cultural Dialogues on Homelessness, Jay Levy and co-authors provide the conceptual tools, the hitherto “missing language”, needed by practitioners and policy makers working with excluded individuals. This well-written and insightful book outlines the psychologically informed approach that has been successfully used in the US, UK and other countries to re-integrate people who have experienced homelessness, severe mental illness and, frequently, other traumatic life events. This book has been informed by the authors’ practice and should come with a warning: it will revolutionise how you work – irreversibly and, undoubtedly, for the better. 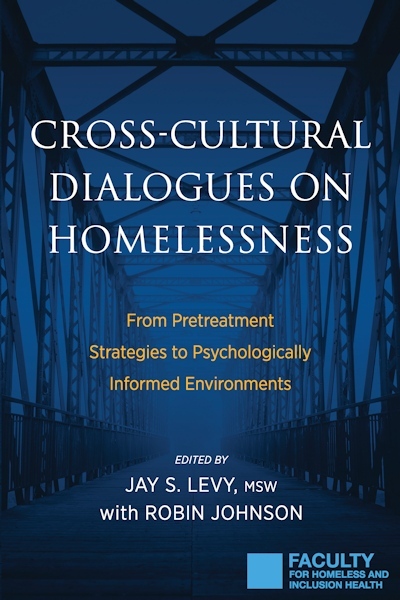 Jay Levy and colleagues’ “Cross-Cultural Dialogues on Homelessness: From Pretreatment Strategies to Psychologically Informed Environments” provides wonderful insight into the profound relationship-building that is the core of street outreach to the unsheltered homeless. Jay distills many decades of his own street experience, and by cross comparing his brilliant schema of Pretreatment with the British model of Psychologically Informed Environments (PIE), he reveals the underlying common processes of effective street engagement. Essentially, Jay shows us how to compassionately embrace the reality of those who fall within the underwater portion of the “pre-contemplative” iceberg of behavioral change. As a long-time practitioner of street medicine, I recommend this book to anyone who seeks that sacred place on the streets where healing begins. More information on the International Street Medicine Symposium can be found HERE. Latest news: -Cross-Cultural Dialogues on homelessness has been added to the student reading list for the module on Homeless and Inclusion Health delivered at the Institute of Epidemiology and Health Care, University College London. Back Cover Synopsis: This groundbreaking book presents compelling narratives and innovative approaches toward addressing the psychological traumas that can underlie homelessness and is the first to explore in-depth what the US and UK can learn from one another. The authors focus on understanding and applying the precepts of Pretreatment and “Psychologically Informed Environments”, as well as learning about effective ways to promote productive dialogue on all levels- with clients, clinicians, advocates, policymakers, researchers, and others. Detailed case studies review and integrate “hands on” practice with Appreciative Inquiry, Open Dialogue, and Common Language Construction methods. 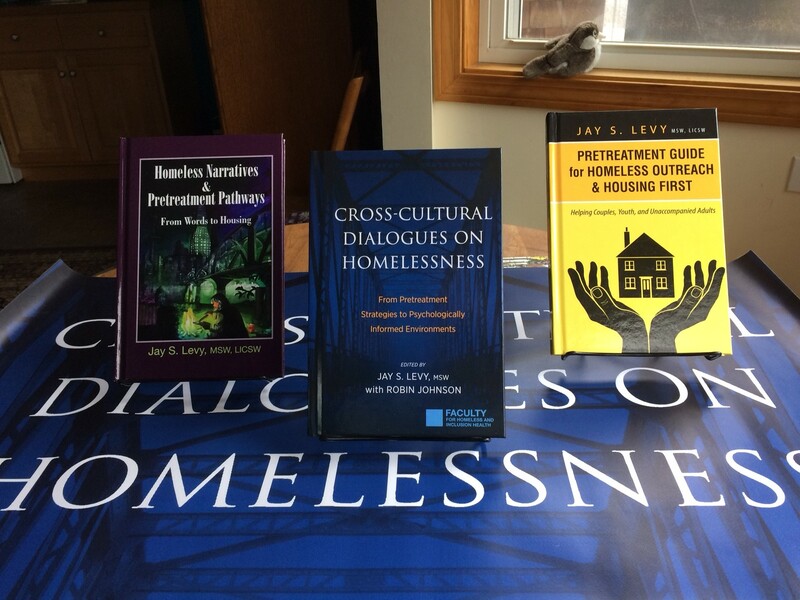 Advance reviews: Jay Levy and colleagues’ “Cross-Cultural Dialogues on Homelessness: From Pretreatment Strategies to Psychologically Informed Environments” provides wonderful insight into the profound relationship-building that is the core of street outreach to the unsheltered homeless. Jay distills many decades of his own street experience, and by cross comparing his brilliant schema of Pretreatment with the British model of Psychologically Informed Environments (PIE), he reveals the underlying common processes of effective street engagement. Essentially, Jay shows us how to compassionately embrace the reality of those who fall within the underwater portion of the “pre-contemplative” iceberg of behavioral change. As a long-time practitioner of street medicine, I recommend this book to anyone who seeks that sacred place on the streets where healing begins. In Cross-Cultural Dialogues on Homelessness, Jay Levy and co-authors provide the conceptual tools, the hitherto “missing language”, needed by practitioners and policy makers working with excluded individuals. This well-written and insightful book outlines the psychologically informed approach that has been successfully used in the US, UK and other countries to re-integrate people who have experienced homelessness, severe mental illness and, frequently, other traumatic life events. This book has been informed by the authors’ practice and should come with a warning: it will revolutionise how you work – irreversibly and, undoubtedly, for the better. 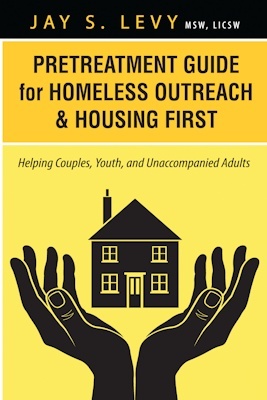 Outreach clinicians, social workers, case managers, and concerned community members are provided with a pretreatment guide for helping homeless couples, youth, and single adults. Chapters explore policy and research accompanied by narratives that trace a person’s journey from homelessness to housing and beyond. The inter-relationship between Homeless Outreach and Housing First is examined in detail to inform program development and hands on practice. Pretreatment Guide for Homeless Outreach & Housing First shares 5 intricate stories from the field to elucidate effective ways of helping, while demonstrating how the most vulnerable among us can overcome trauma and homelessness. 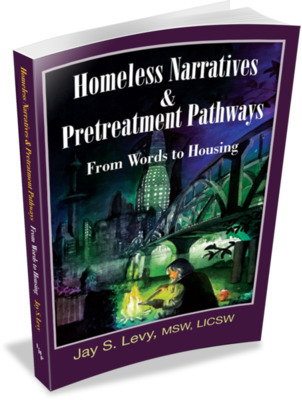 The critically acclaimed book Homeless Narratives & Pretreatment Pathways: From Words to Housing is based on my many years of doing outreach counseling, advocacy, and developing housing alternatives for chronically homeless individuals throughout NYC, Boston, and Western MA. Stories of survival, meaning making and overcoming are shared along with an approach for helping those who are most in need. E-book, paperback, and hardcover versions are available here, as well as online via Barnes & Noble, Amazon, and many other outlets. Levy crafts stories of characters who sear the memory: Old Man Ray, the World War 2 veteran who resents the VA system and regards himself as the de facto night watchman at Port Authority; Ben who claims to be a prophet disowned in his own country, crucified by the government and enslaved by poverty finds a bridge to the mainstream services and a path to housing through the common language of religious metaphors, including redemption and forgiveness; and Andrew who has been “mentally murdered” is helped to understand his own situation and gain disability benefits through the language of trauma; among others. These stories are deftly interwoven with theory and practice as Levy constructs his developmental model of the engagement and pretreatment process. The outreach worker strives to understand the language and the culture of each homeless individual, builds a bridge to the mainstream services, and helps those providers to understand the special circumstances of these vulnerable people. Levy bears witness to the courage of these pilgrims who wander the streets of our cities, and his poignant book is a testament to the healing power of trusting and enduring relationships. Jim O’Connell, MD – President and Street Physician for Boston Health Care for the Homeless Program. Dr. O’Connell is nationally recognized as one of the preeminent experts on homelessness and health care. A full listing of Jay S. Levy’s publications and more than 70 citations of his published work are now available at google scholar. 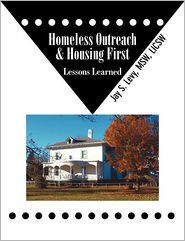 Homeless Outreach & Housing First: Lessons Learned by Jay S. Levy is an innovative and timely educational resource. This monograph (educational booklet) features three written works on homelessness inclusive of an article on moral, fiscal, and quality of life considerations, a new story entitled “Ronald’s Narrative: The Original Housing First”, and an interview that was originally featured in Recovering The Self: A Journal of Hope and Healing. These three documents provide a rich and fertile resource for learning, reflecting, and informing needed action that promotes high quality outreach services and housing stabilization for the most vulnerable among us. Homeless Outreach & Housing First (Kindle, Nook, and paperback versions) can be purchased here, as well as at Amazon and Barnes & Noble Websites. 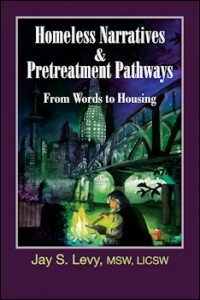 The highly acclaimed book Homeless Narratives & Pretreatment Pathways: From Words to Housing is based on my many years of doing outreach counseling, advocacy, and developing housing alternatives for chronically homeless individuals throughout NYC, Boston, and Western MA. Stories of survival, meaning making and overcoming are shared along with an approach for helping those who are most in need.